Laura Mercier Crème Bruleee Hand Creme, 2.0 oz. 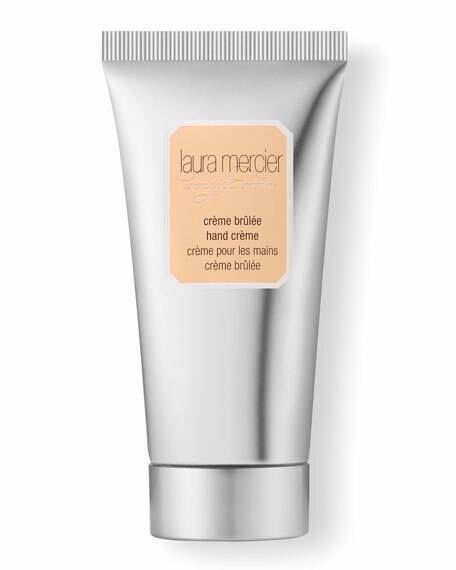 Laura MercierCrème Bruleee Hand Creme, 2.0 oz. Laura Mercier Crème Brûlée Hand Crème is a deep penetrating creme that leaves the skin velvety soft to ensure the healthiest and smoothest hands. Crème Brûlée introduces the aroma of a French Patisserie to your home with delicious notes of warm caramel, spun sugar and French vanilla bean for a sensual and enchanting experience. Grape and Olive Oils soften and moisturize. Soy proteins rich in amino acids help in the repair process. Fragrance is a deep rich caramel with nuances of sugar, vanilla and musk. Replenishes and locks in moisture into the skin.